Your pet has insurance – do you? According to Douglas Adams, the answer to the meaning of life is 42 – and 42% of people in a recent poll by Friends Life considered health insurance to be important compared to the 14% who deemed pet insurance a necessity. Yet despite this perception, 21% of those polled had pet insurance and only 9% had a critical illness or income protection policy. Yes it’s true – more people tend to insure their pet than their health or their family. And we can understand that. 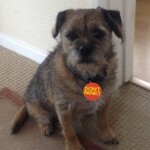 Toby our grumpy Border terrier or “Dornica Melody Maker” to give him his full name, was insured as a young pup. It was a given. And I can’t think of one of his doggy friends who don’t carry pet insurance, yet I know some of their owners do not have the equivalent human cover. So what is critical illness cover and why should you have it? Nobody likes to think bad things happen, but they do. Life is full of curve balls. Two years ago Lee wrote a top-up life insurance policy for a client to cover his new mortgage. The insurer asked for a full medical which the client duly attended. His client called several weeks later to tell Lee that the policy would not be going ahead. The medical revealed our client was in the early stages of cancer, fortunately treatable. The better news was he already had critical illness cover in place. So at a time when it would have been difficult to work he was able to take time off to recover. So that’s why it’s worth having critical illness cover. As long as you get one of the critical illnesses covered by the plan, it pays out a lump sum and you can buy yourself time. I confess – I have pet insurance but not health cover. What can I do? As the book says, don’t panic. Cover can be more affordable than you think. Due to the advances in medical science, critical illness survival rates are improving so having money available while you recover is even more worthwhile. Even a little cover can go a long way. If you want to know more, give us a call and we will guide you through the various types of cover available so you get the right cover at the right price.